I received word by post today from Cindy Crabb (DORIS zine, generally incredible human being) that she will be carrying my zine in her distro! This is exciting. It seems that every day lately I'm packing up zines and sending them out into the universe via the post office. It has been necessitating so much organization! I'm just trying to keep up with myself, mostly. I have also been working on another zine, because I guess I just don't know how to relax. I will be tabling at the Rochester Zine & Craft Fair and the Chicago Zine Fest at the end of this month, and am hoping to have the new one ready by then. It is a games zine, compiling directions, drawings, and stories about all of the games my community of friends have invented, inherited, and doctored up in the past bunch of years. Playing games has been a big part of my life, and sharing it feels crucial. Fingers crossed that I can get it together in time! I am enlisting the help of all of my friends with whom I have shared the games communion over the year, and who are often much more artistically inclined than myself, to help draw and do descriptions. I am hoping this project has the warmth of many hands on it: I am mostly hoping that it inspires people to PLAY GAMES AND INVENT GAMES. You know. The important stuff of life. A little bit ago I got back from the weekday tour with klessa. Right before we left, I got the flu, and spent an intense week in recovery-mode, doing little besides sleep, try desperately to sleep, fall victim to nyquil due to failed attempts at sleep, and watch Seinfeld. There was a lot of tea-drinking and full body pain in there as well. I managed to put together a poster somewhere in between coughing fits, however. Using beautiful Matt Gordon-crafted illustrations, I photoshopped together a poster and separated the layers for Cheryl to silkscreen in Rochester. A real team effort, y'know? Well, last-minuteness, wacky and unpredictable exposure times, and Cheryl's general perfectionism (I mean that in the BEST way, the girl's a PRO) kept the posters from actually getting made, but I figured the image is worth sharing, given how much time ended up being devoted to it between the three of us. 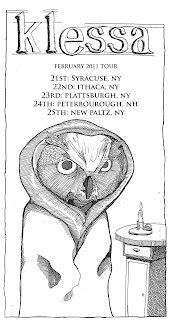 Our tour went incredibly well, and I feel so elated to have been able to spend that time with Simon, Matt, and Cheryl, and so grateful for all the support we received/so grateful that people are still excited about us/came out to see us/are willing to watch us. We don't live near each other anymore, so any time together is super valuable and important. We hadn't played in almost a year and still received so much good energy, encouragement, and support. I'm incredibly appreciative/somewhat blown away by all of it. Thank you to anyone who came out to the shows/said nice words/listened to our strange strange music. I also did spend a day last week making a bandcamp page for klessa. Our album had previously not been available online, for downloading or streaming, and I guess we figured that it might be time to take the plunge. We also aren't playing regularly, so there isn't a really easy way to obtain our record. So now it is available for free to download, and you can also choose to donate any amount of money for it if you feel inclined! There is also an option to buy a physical copy if you want it. The actual CD packaging has sweet artwork of Matt Gordon's that Cheryl and I slaved over silkscreening, amazing collaged inserts with lyrics & gratitude that Simon crafted, and the CD itself has a beautiful drawing of Sarah Ayton's. We are all very proud of the whole thing, and are excited to share it with you. Head to http://klessa.bandcamp.com to have a listen/scope my layout. Cheryl recorded all of our sets on tour, so hopefully soon we will have a free release on bandcamp of live tracks from those shows. There are 2 new-ish songs and 1 song we never recorded that should be included when that comes out. 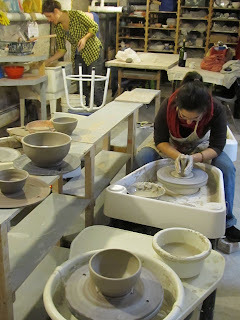 Before I got sick that week, I also was lucky enough to be able to spend time in the Women Studio Workshop ceramic studio, learning how to throw bowls on the wheel. The Women Studio Workshop is a really swell place in Rosendale filled with studios for papermaking, general printmaking, silkscreening, letterpress, ceramics, and darkroom photography. I had a membership last year, hoping to devote myself to some coveted and much missed darkroom hours, but never ended up able to coordinate myself properly to get in there. 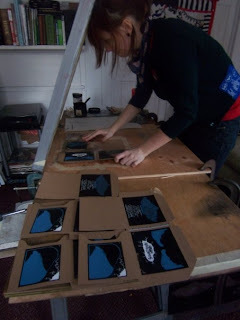 I have, however, utilized their silkscreening studio, and now, the ceramics den. My good friend/god-send of a person Marybeth is the ceramics coordinator, so she let me and some other pals come in to do some work. 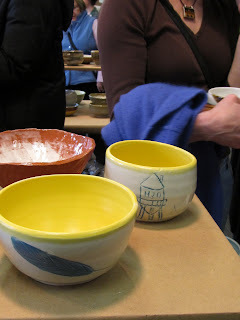 The Chili Bowl Fiesta is a yearly event in which the workshop obtains money to run for the year and fund fellowships for artists by selling beautiful handmade bowls made by volunteers, workshop members, and ceramics aficionados like MB. Local businesses then provide chili to eat in your new bowl! It's a win-win situation, basically, and I got to help make bowls for the event. I went back a second day to trim my bowls and do some drawing and underpainting. In the end of things I didn't purchase one of my own bowls, (I fell madly in love with a different one and who am I to deny LOVE), but my friend Devin saw fit to purchase one I had painted kites all over, and I was told later that my other ones were purchased, too. Success! I drew a sloppy water tower on one of them in a hurry: an homage to my favorite giants of the sky. I drew a feather on one side of another bowl I made: an homage to my newfound feather collection, most of which have been obtained both in the boiler room of the bookstore I work at, and from the ground on walks between Mulberry street and My Market. With my feather-source now revealed, I trust none of you will be poking around those routes looking to undercut me. It's just not polite. To show my radiant THANKS to some pals who graciously helped me out a bunch at the New Paltz show I put on a week ago, I did what anyone would: I made them baked goods. As I established in a past post, I haven't been baking very much lately, and it feels straight-up shameful/I feel out of balance. So, it was lemon squares for Matt Ross, and cinnamon buns for Bryan and Michelle. I took this photo of them BEFORE sprinkling powdered sugar all over the lemon squares. You'll have to forgive me. Also on the baking-tip, I made a cheesecake with some pals the other night. We went overboard, as we tend to when it comes to desserts, and whipped up a blueberry-oreo creation. Graham cracker crust, springform pan, the whole deal. It was other-worldly. Sometimes I am really good about staying away from processed sugar/eating really well. This past week HAS NOT been in that vein. Also: lately I have been playing music with The Gremlins, a project of mine and my friends' in which we select only the most killer 80's (and 90's? perhaps we are branching out: walls are for chumps.) tunes and cover the heck out of them. It's a ridiculous amount of fun. 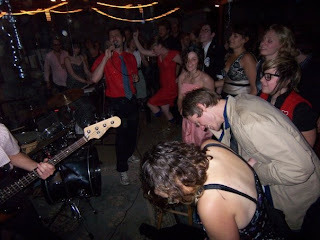 We formed in 2008, played the last Rugroom Show, a show in a parking lot, and then sort of disbanded. Recently a few of us became inspired to put it back together (under the guise of The Gremlins: The New Batch), and we've got a new line-up, and new jams. In the first amalgamation, I played the keyboard, but this time around I'm playing guitar. It's such a good time, and once we've got a larger arsenal of songs under our belts, we're going to be seeking out house parties/rowdy social events to play. I am playing piano in Squeeze's "Pulling Mussels from the Shell," and have been killing myself lately over trying to learn the intense piano solo that Jools Holland bestows two-minutes in. In a recent late-night show performance, he butchers the solo on an iPad, so I don't feel as intimidated as I did to start out. But still, know that much of my time lately has been spent learning that solo/blissfully playing Tears for Fears/Pixies/Devo/etc songs in a basement.